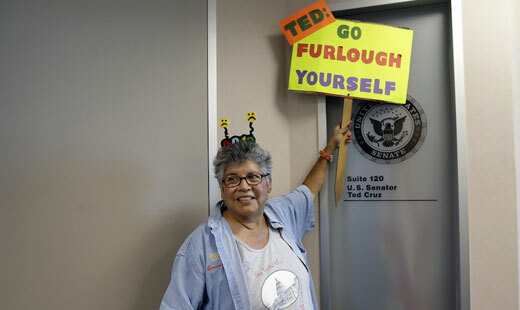 About 50 activists, many of them retirees, gathered outside the office of Senator Ted Cruz in Dallas on October 15. Cruz had about 15 supporters on hand. Sharp words were exchanged, and one skinhead inserted himself among the anti-Cruz protesters in an obvious attempt at provocation, but we remained peaceful and legal. “Shut down the shutdown!”, “We choose, no Cruz!”, and the ever popular “Hey hey ho ho, Ted Cruz has got to go!” were popular chants. TV cameramen from all the local stations wove in and out of the protesting crowd. A member of the American Federation of Government Employees held a sign that read, “Honk for sanity!” About half the passing cars responded, and the crowd cheered them on. Organizing for Action called the event, but the response came from several organizations and quite a few independents. Among the union folks there were railroad workers, autoworkers, government employees, actors, and transport workers. The new head of the Dallas AFL-CIO participated, as he has at most recent street actions.